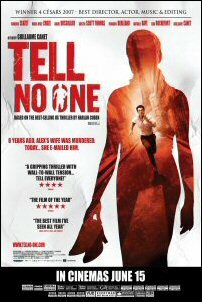 Tell No One is easily one of the finest movies we’ve seen in 2008. It’s safe to say that our Bollywood and Kollywood idiots and thieves won’t be making movies even a tenth as good as this French thriller for a long time to come. An amalgam of talent in the form of fine performances by actors François Cluzet, Kristin Scott Thomas, Nathalie Baye et al aided by a solid, gripping story and deft direction by Guillaume Canet delivers a solid treat to viewers. This fast-paced movie tells the story of a pediatrician Alexandre Beck (François Cluzet) whose wife Margot (Canadian actress Marie-Josée Croze) was murdered eight years earlier when they were skinny-dipping in a desolate stream on a dark night. The case remains unsolved and Alex is still under suspicion because he’s mysteriously survived the attack. The police just can’t understand how the badly injured doctor managed to get out of the water on his own. Alex’s placid life is turned upside down after he receives a mysterious e-mail with a video that suggests his dear wife is not dead. The e-mail warns Alex to Tell No One as they are being watched. From the moment the e-mail arrives, Alex is forced to be on the run from both the police as well as some other really, unsavory people who want him out of the way. François Cluzet is an amazing actor, so unlike any of our buffoons like Abhishek Bachchan, Ajith, Upen Patel, Priyanka Chopra, Kareena Kapoor, Katrina Kaif et al we see in Hindi and Tamil movies. There are no wasted expressions on François Cluzet. François Cluzet won the 2007 Cesar Award (National Film Award of France) for Best Actor for his role in Tell No One. The 53-year-old Cluzet richly deserves all the accolades he’s received for Tell No One. As with great books or extraordinary movies, in Tell No One it seems as if you are watching an event happening right before your eyes. Besides a fine performance by François Cluzet and his co-stars, what makes Tell No One an amazing movie is the careful attention to the story and screenplay. Tell No One is proof that you don’t need James Bond type characters to have a good thriller. Ordinary pediatricians will suffice, thank you. The pace never slackens (particularly after Alex receives the e-mail and starts probing into the matter of his wife’s death) and there are some neat twists as well. By the way, Tell No One is based on the novel of the same name by American writer Harlan Coben. It’s when you watch outstanding movies like Tell No One that you realize how amateurish our Bollywood and Kollywood productions are. Tell No One is unlikely to be released in India. So if you happen to be in New York now, you can catch this fine movie at Landmark Sunshine Cinema in Lower Manhattan. Even if you are unlikely to be in the Big Apple anytime soon, fret not because Tell No One should be out on DVD in October this year. If you love fine movies as much as we do and if you are tired of Bollywood crap like Love Story 2050 or Thoda Pyaar Thoda Magic, you’ll surely not want to miss Tell No One. 3 Responses to "Tell No One – Gorgeous Movie"
Watched this film today… One of the best films I’ve ever seen..
We’ve watched two other films starring François Cluzet in the last six months – Little White Lies and The Intouchables. Two days back, saw another fine French film on DVD – Monsieur Ibrahim (Omar Sharif, 2003). Will do a brief post tonight on Monsieur Ibrahim. Little White Lies looks interesting. Looks like Asghar Farhadi’s The Past has been getting very good reviews at the Cannes..
1, I was not aware of Le Passé (The Past). Last August, I watched and enjoyed Asghar Farhadi’s A separation. Lovely film. Le Passé should hit U.S. screens in a month or two. I’ll try to watch it in the theatre instead of waiting for the DVD. 2. Ramin Bahrani is another director of Iranian origin you might want to check out. I liked his Chop Shop. Unlike Asghar Farhadi (who’s Iranian and makes Persian/French films), Ramin Bahrani is an Iranian-American director and makes English films. Bérénice Bejo (from The Artist ) has won the Best Actress award at Cannes for The Past .. I just realized we did a brief post on Chop Shop in 2009.